The underside of the leaves of Rhododendron traillianum are apparently sweet-smelling, but I didn’t think to try it so I can’t describe the scent. Perhaps Douglas will describe the scent in a comment. This species is native to southwest China and Tibet. 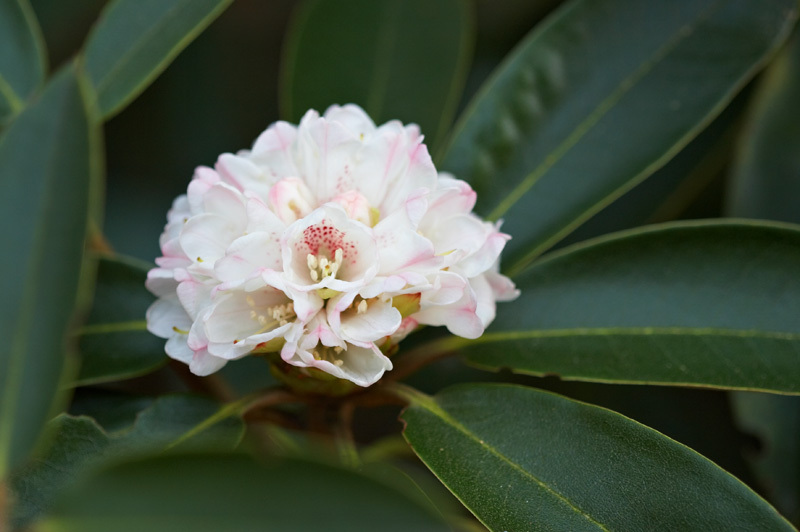 The Flora of China provides a detailed description, while the American Rhododendron Society provides a quick factsheet. More images of Rhododendron traillianum can be found in the photo galleries of Asperupgaard, a Danish garden. When I have seen this in person have enjoyed contrasting combination of pale flowers with dark indumentum. I once wrote an article on appreciating rhododendrons for foliage, wherein I celebrated that wonderful, but under-rated, subsection of rhododendrons, the Taliensia (I love the sound of that name). I described R. traillianum as smelling of camphor and peach soap. What the hell was I smoking? I wasn’t and no, in retropspect, I think I was actually pretty accurate. Just so you know I’m not kidding around (this being April 1st and all), I also ascribed camphor, honey and mint to the aroma of R. balfourianum and camphor, cloves and soap to R. wasonii. The article was presumably read by a few people (it was even reprinted in another publication), but I got nary a peep out of anyone. Either they believed me or didn’t feel like disagreeing in public. Maybe they just gave up reading after the first paragraph. Another possibility is that people think I’m nuts, that these smells are all in my head. I have run into a few true onosmics (people with no sense of smell), but surely, most people can differentiate Abies grandis from A. amabilis (respectively: lemon + pine Mr. Clean vs. tangerines). No? To be honest, I’ve met non onosmics who couldn’t smell their way out of a detergent aisle in a supermarket. Maybe people are just too shy to describe smells. I don’t know. Okay. This is a plea to those people–and I know you’re out there–who go around sniffing at plants like I do (let me assure you, I limit this behaviour to plants). Anybody ever smelled the unfolding leaves of Nothofagus antarctica? Yes, Antarctic beech has a resinous cinnamony smell in spring. I point it out whenever circumstances permit. Hey Daniel, lovely rhodie but the Danish links are forbidden! Why are the Danish links forbidden??? Is it possible that a bandwidth limitation was briefly met? Only other things I can think of would be a local firewall configuration problem or an IP banning configuration on the Danish web server. I think there was a problem with my internet connection earlier this morning (late evening in BC!). Everything should be ok now. According to ‘awstats’,there was an interval of 80 minutes with no visitors. So far 40 visitors via UBC since yesterday. I hope that Sue will make a second try!